Should I buy a New Home or an Old Home? Everything Is New: There’s no need to worry about replacing the air conditioning system or roof, and you’ll find that everything throughout the house is pristine. This is inherent when you choose a new home vs. a resale home. 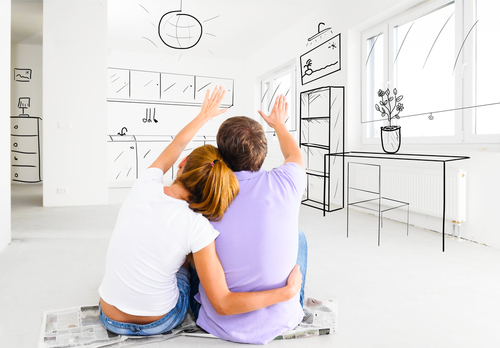 Everything Is on Trend: New home construction often includes floor plans that are right on the current trends. For example, open floor plans are all the rage in the 21st century, so many new-construction homes feature them. Also, you often get to choose the finish you want when you select new construction — rather than settling for what’s already there. Everything Is Protected: Most new home construction comes with a builder’s warranty that lasts a year or so, and most of the new systems in your home carry their own warranties — plumbing, electrical, HVAC, etc. New home construction has its downsides, too. Most often, new homes are built in suburban areas where there’s more space — so, if you want to live in the city center, you may be out of luck. Also, relatively new homes are a little behind in resale value. This is because builders are typically constructing more homes just like it in nearby areas. Anyone who might be interested in your home is likely to start with a brand new model that allows them to pick and choose the exact finishes they want. Everything Is Established: When you choose new home construction, you may find you’re living in a construction zone for the first couple of years. You may also find that nearby restaurants and retail are just starting to open. New construction takes place in new areas, and it takes a while for those neighborhoods to fully establish themselves. That’s not the case with resale homes. Even the trees are mature and established. Everything Is Settled: If you’re going to have any foundation issues, they are likely to appear during a home’s first 10 years. Most resale homes have done all the settling they’re going to do, so you can rest assured that what you’re buying is structurally sound. Everything Is Charming and Quality: It’s true: They don’t make them like they used to. Most resale homes have a charm factor that’s lacking from new construction. Plus, the quality of construction practices used in the mid-20th century far exceeded what you’re likely to get with a newly constructed home today. Of course, when you choose a resale home, you can’t choose the finishes you want. You may immediately need to replace an AC system or roof. You may also find that closets and bathrooms are smaller, and that the floor plan is a lot less open than you would prefer. If you find yourself caught up in the new home vs. older home debate in York, Pennsylvania, make sure you have an expert on your side. At CENTURY 21 Core Partners, we work each day with area homebuyers and sellers, supporting their real estate needs and ensuring they meet their goals. When you want experience, knowledge and commitment on your side, secure an agent from CENTURY 21 Core Partners. Contact us today to speak to an agent about buying a new vs. resale home.